The major part we can say almost half of the town lives in the apartments. Electricity prices have jumped dramatically in just the past few years more and more homes, buildings, apartments are finding out the ways to reduce their power bills. Most apartment complexes choose to shift their common area lighting loads, such as staircase, parking and security, to solar power. Not only are these loads consistently switched on for long hours, reduction in the electricity bills associated with them would benefit all the residents and not any single one. 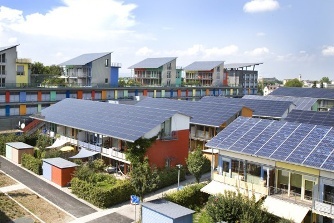 So creating a sustainable residential environment in energy-efficient buildings is an important goal for the future. For every unit of electricity that you generate from your solar power system, you will draw less from the grid. If your apartment complex installs a 20 kW solar power system, you will end up saving 3 to 4 lakh Rupees per annum! We grace renewable energy to complete the goal manufacture, supply and install all type of solar solutions for apartments.